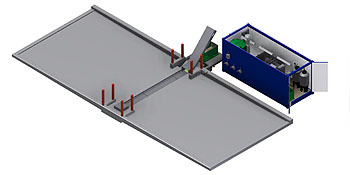 Automatically removes heavy solids from wash rack and deposits into a portable hopper. Eliminates manual demucking of troughs. Runs in sync with treatment systems. 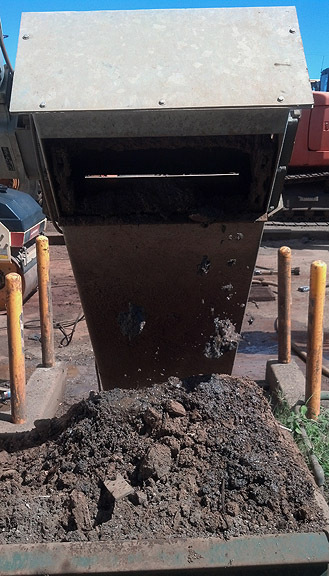 Reduces load moisture for lower disposal costs. Reduces wear on filters and saves on consumables. Can be retrofitted to concrete pads. 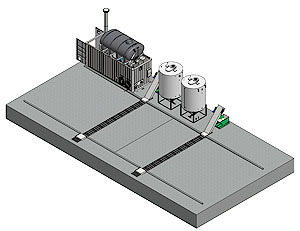 Engineered rendering of concrete pad wash rack with automatic conveyor trough for mud removal. 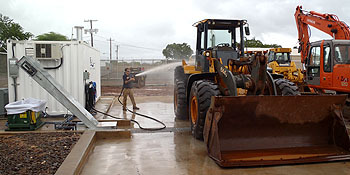 In many cases, you may already have a useful wash area, but you need to capture the water before it goes off your property, whether to sanitary sewer or a drain field. If you have an existing pad, we can help you improve it, or bring it into compliance.